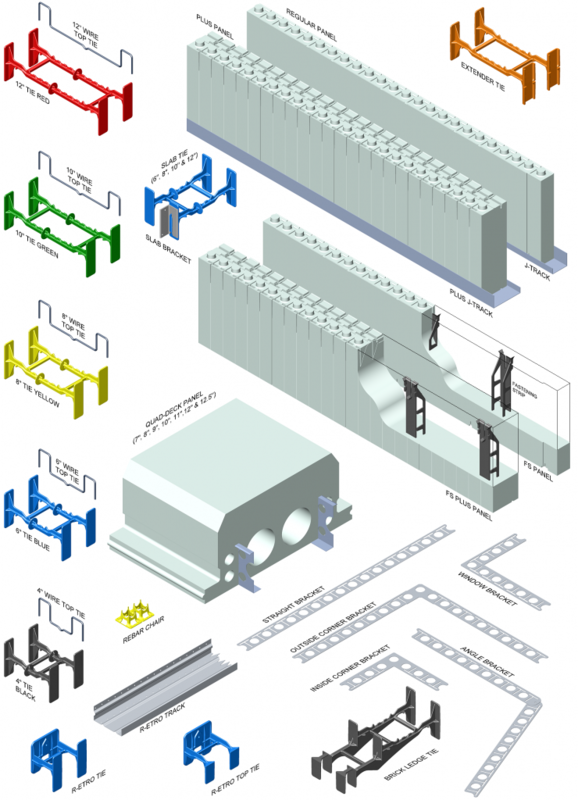 These components allow assembly of all concrete forming for your walls, including corners, arches, any angles, columns and pilasters, as well as T-Wall connections. Transport and storage costs of Quad-Lock are substantially lower compared to pre-assembled block systems. Ordering and keeping track of inventory is easier (you would need at least 45 different parts to do the same with pre-assembled blocks). Six different standard wall widths are available (nominal concrete widths of 350mm, 300mm, 250mm, 200mm, 150mm, and 100mm) and can be combined with the Quad-Lock Extender Tie to add 305mm to any standard cavity size. Many insulation values are possible, giving you the choice of true U-values of 0.28, 0.20, 0.15 and lower. Also refer to the available Accessories for Quad-Lock.